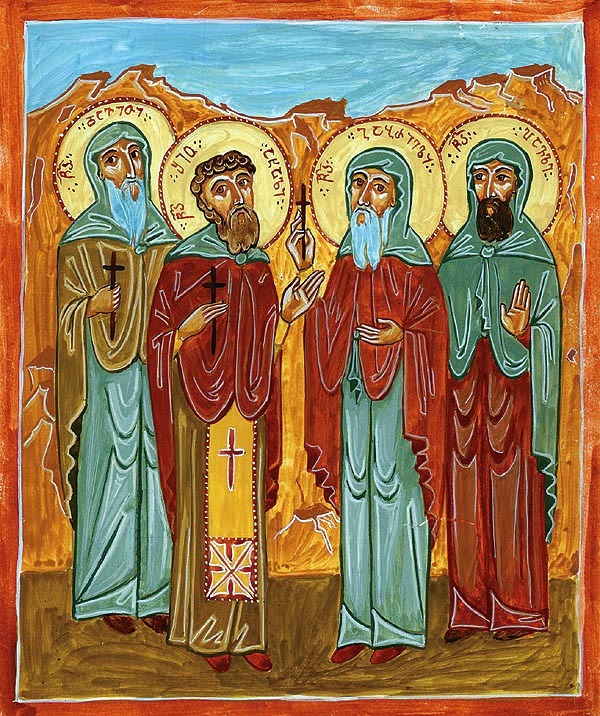 The Holy Venerable Martyrs Shio the New, David, Gabriel and Paul labored in the David-Gareji Wilderness at the end of the 17th century. Saint Shio was from the village of Vedzisi in the Kartli region. His parents, Papuna and Tamar, were wealthy and highly influential people. They had eight children: five sons and three daughters. After their parents died, Shio’s brothers quarreled so intensely over their inheritance that the eldest brother finally killed the youngest. With great joy Onopre received Shio, who was already revered by many for his faith and chastity. He directed him to a cell and clothed him as a novice. Blessed Shio’s tireless labors, humility, and manifest love for his brothers inspired many to seek his counsel. The abbot himself often trusted Shio to administer the affairs of the monastery in his absence. Once Fr. Onopre departed to attend to some matters outside the monastery, leaving Shio in charge. After Vespers and a meal, the exhausted brothers were settling down to rest when a band of Dagestani robbers suddenly stormed the monastery grounds. They ransacked the monastery and captured Hieromonk Shio and the monks David, Gabriel and Paul and killed them. Some of the brothers who remained tried to flee, but they were caught and brutally slain. The cells of the David-Gareji Monastery were soaked with blood. Then the Dagestanis, yet unsatisfied, seized and destroyed nearly all the monastery’s property. They stole some of the clerical vestments, and the rest they cut in pieces and tossed in a well. Then they hacked the holy icons to pieces with their axes. With the blessing of the catholicos and by order of the king, the mutilated relics of the holy martyrs were buried in the courtyard south of the grave of Saint David of Gareji.